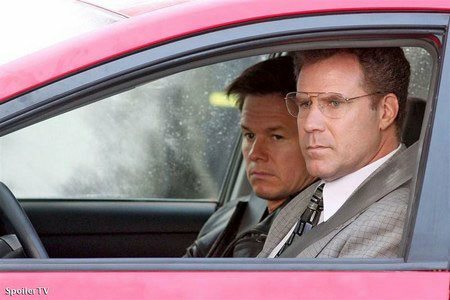 Will Ferrell and Mark Wahlberg star as cops in this comedy directed by Adam McKay and co-written by McKay and Land of the Lost scribe Chris Henchy. Dwayne Johnson, Samuel L. Jackson, and Steve Coogan co-star. When a forensic accountant and a trigger-happy detective, both of whom idolize the city's top cops, get a chance to step up and improve upon their "B team" status, things don't quite go as planned. Download The Other Guys in Digital HD from the iTunes store. The Other Guys images are © Columbia Pictures. All Rights Reserved. In the tradition of buddy cop movies and television shows, like Miami Vice, Starsky & Hutch, Lethal Weapon, and Dragnet comes The Other Guys. But what does that title have to do with those buddy cop movies? Well, this is the story of the other cops, that you only see in the background of those stories. The ones that don't get the limelight. The ones that do their paperwork and make it home safely without destroying the city. Will Farrell and Mark Wahlberg star as Detectives Gamble and Hoitz, and this movie is their story. Always stuck in the background with top cops P.K. Highsmith and Christopher Danson taking the limelight (played wonderfully by Samuel L. Jackson and Dwayne Johnson), Gamble and Hoitz seem to be a mismatched pair, with the Toyota Prius-driving Gamble always volunteering to finish Highsmith and Danson's paperwork for them, and Hoitz wanting to get on the street and solve crimes. Perhaps unfortunately for him, his wish is about to come true. Although the movie takes a little time to get up to full speed, once it does, it doesn't let up - a two hour hybrid-induced fun ride. A different kind of Will Farrell in this movie - not the Will Farrell from Anchorman or Talladega Nights, but a new kind of humor - which he has back, with Mark Wahlberg surprisingly strong in his role as the straight man in this humorous buddy cop movie. Don't expect it to be anything else - you won't be expected to learn anything or really see characters develop throughout the course of the movie - just sit back and enjoy the ride. Story/Script/Plot Development (B): This movie did not have high expectations from me when I noticed that it was written by Chris Henchy, who wrote The Land of the Lost, also starring Will Ferrell. But it was also co-written by Adam McKay, who wrote Anchorman and Talladega Nights (in addition to years at SNL). And that is what I think allowed this movie to succeed. Almost taylor-made for Will Farrell, the movie is littered with short jokes, some of which should stick with you later in the movie. One in particular I was still laughing at when I left the theater. However, the plot development is lacking in this movie, and the details of the case are hard to follow. But honestly, it isn't crucial to the movie - this is supposed to be a funny buddy cop movie, like the Dragnet movie with Tom Hanks and Dan Aykroyd. Cinematography (B): The movie is very limited on intense car chases or fight scenes (in fact, they open and basically close the movie), but on the whole the cinematography is average but not a problem with the movie. The car chase scenes are very well done and fit with the story - at the same time adding to the humor. Acting/Chemistry (A): Will Farrell has possibly found a new groove with his role of Detective Gamble. This isn't like his over-the-top performance in Anchorman, but rather a new one - one like the comedy duos of old, like Laurel and Hardy, or like I've mentioned before - Sgt. Joe Friday from the Dragnet movie. He delivers his lines with impeccable timing, and while there are times you can't tell if he's being serious or sarcastic with his lines, it all flows together properly. Mark Wahlberg does a wonderful job as Detective Hoitz, who has a funny backstory that has no bearing on the movie than as a comedy tool (they refer back to it a few times). He is the straight man to Will Farrell's funny man. And it works. At first I wasn't sure if he was a good fit, but by the end, he proved why. Steve Coogan (Night at the Museum, Tropic Thunder) plays David Ershon, the main perp that Gamble and Hoitz are after. While his roles have been minor in those movies, he handles this role with a little bit of comedic flair, which fits perfectly into the show. Eva Mendes does a wonderful job in her role as Gamble's physician wife - I'm not going to mention anything else so you won't be spoiled when you see the movie. But the most refreshing work was done by Michael Keaton, who plays Gamble and Hoitz's Captain. He is back. Back to the way he was in Gung Ho and Mr. Mom - with all of his vocal and facial emotions that he can portray. You can tell that he gave this role his all - he really shines here. Use of locations/Costumes/Special Effects (B): New York City, nothing special there. Costumes are ordinary, and the only non-car chase special effect was used in a bar scene, and it was done well to show a story without being boring. Movie Score (C): I had to give a lower score here. I didn't notice a score, but the songs throughout the movie are appropriate, and in fact, some of the main songs were written just for the film, with McKay and Farrell assisting on them. Those songs kept this grade from being lower. Final Grade (B): The more I think about it, this movie is really close to being a basic remake of the Dragnet movie. But one of the biggest differences is that in Dragnet, Sgt. Joe Friday was the top cop - he brought down the high profile criminals. But he did it without flair or getting the limelight. 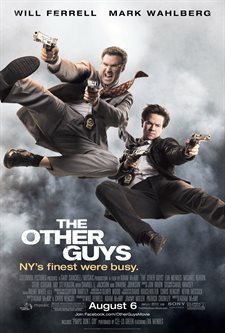 Which is the basic premise of this movie - "The Other Guys" - those who get the job done in the background. But most of the ‘other guys' aren't this funny while they do it. So if you're in the mood for a movie that doesn't require you to think, and have some laughs at the same time - The Other Guys is for you. The Other Guys images © Columbia Pictures. All Rights Reserved.